Other Products by Staunch. Search other Pre-Workouts products. 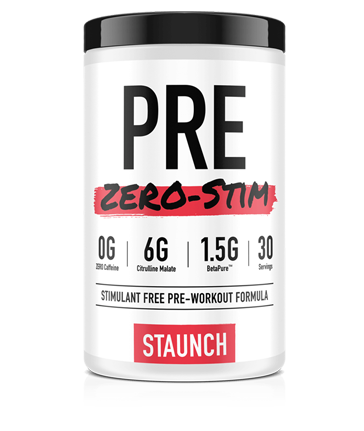 Staunch Pre Zero Stim is a great pre-workout for those not wanting caffeine or other herbal stimulants. Many are making the shift away from stimulants for a variety of reasons, such as late training routines, high caffeine intake from other sources, such as coffee, and for those that train multiple times daily. Staunch Pre Zero Stim contains 1,500mg of carnitine per serve, so you can be sure that your daily dose of this important dipeptide is covered. Carnitine is a fantastic ingredient for any gender, assisting with fat burning and mitochondrial energy synthesis via the transportation of long-chain fatty acids1,2. Other roles have been identified for carnitine too. Research indicates that it reduces muscle injury after exercise and subsequent muscle soreness, improves blood flow, has antioxidant effects, boosts mood and protects nerves3,4. Staunch Pre Zero Stim also contains N-Acetyl L-Tyrosine, which supports the synthesis of neurotransmitters in the brain that assist with memory, mood and focus, as well as assisting with adrenal gland health and general energy levels. The Nitric Oxide Enhancers Citrulline Malate, Inositol-Stabilised Arginine Silicate, Agmatine and Norvaline in Staunch Pre Zero Stim make this one of the most potent muscle pump formulas on the market today. But it's not all just about muscle pumps, right? We also want our muscles to adapt and grow in response to the training that we do. That way they can be big all the time, not just after training. That's why Inositol-Stabilized Arginine Silicate has been used. This powerful combination of arginine and silica has some amazing benefits associated with it. One research paper highlighted its ability to reduce markers of muscle damage after exercise by a whopping 44%! This was evident in the reductions of creatine kinase and lactate dehydrogenase seen compared to placebo5. Furthermore, the subjects reported more energy before training and increased muscle pumps (which were actually measured). And then there's citrulline malate, and agmatine, and norvaline ... Citrulline alone offers 50% less delayed onset muscle soreness, and that's after a session with more bench press and leg press volume6,7. Staunch Pre Zero Stim contains betaine, another interesting ingredient that has scientific evidence behind it. Studies show improved squat performance, increased arm size along with improved body composition, and increased bench press work capacity and power8,9. Add a heap of B vitamins into the mix for enhanced energy levels and reduced stress, and you've got a stim free pre-workout that doesn't make you miss stims at all ... not one bit. Staunch Pre Zero Stim is an exceptional formulation from a company that truly stands for scientific integrity, which means you get to enjoy the benefits. OTHER INGREDIENTS: Natural and Artificial Flavours, Sucralose, Calcium Silicate, Silcon Dioxide, Red #40 Lake.